Nautical inspired dinnerware for the student-budget! 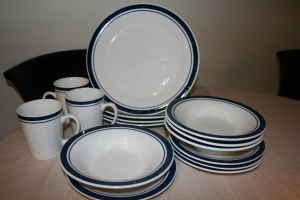 I was your ad on Criagslist for the Nautical inspired dinnerware http://toronto.en.craigslist.ca/tor/hsh/1085994730.html. I am in the market for some new dinnerware and this looks like it could be the set. I especially like how wonderfully nautical it is. I assume you have been serving fish on it (what else would you put on it? It is SO nautical). Anyway just wondering if you could send me a few pics of it with some fish on it so I can get a feel for how it works.